Kensington Scott are the leading bespoke kitchen designers and fitters based in the South East. With more than three decades of experience in creating beautiful and functional kitchens in a variety of unique styles, you can be sure we can find a design solution for your space, no matter how big or small and to a variety of budget sizes. Come visit us at our kitchen showroom in Tonbridge, Kent, to browse our beautiful and vast range of luxury, yet affordable, kitchen options. When you visit our kitchen showroom, you’ll only find one brand - Mereway. This is because we only supply hand-crafted designer kitchens of the highest quality, luxury and value, and for a manufacturer that meets these requirements, you need look no further than Mereway. Mereway has a reputation for their commitment to the detail in even the smallest places, which allows them to create truly custom kitchens that resonate quality with every touch, using only traditional materials and methods. As Mereway Gold Premium Partners, we are committed to supplying only the highest quality kitchens at the best value. 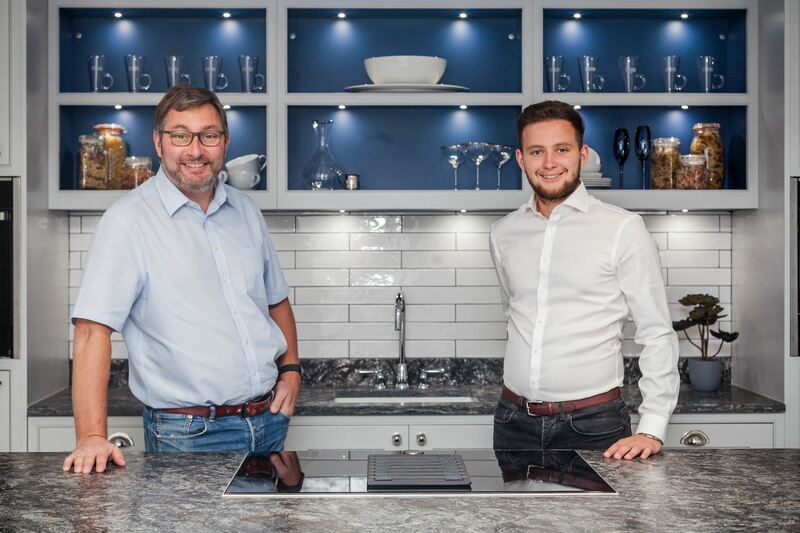 Like Mereway, Kensington Scott is a family run business, meaning we both share the values of creating unforgettable kitchen designs and providing excellent customer service. Nothing matters to us more than knowing that we have created the kitchen of your dreams all while making the entire process a smooth and enjoyable one. Whether you’re looking for a modern gloss kitchen to create an open plan design, a classic kitchen that pays homage to the brilliance of traditional British design or anything in between, our range of kitchens at Kensington Scott will have the perfect style. To get a real feel for the timeless quality of our kitchens and which style will suit your desires, drop in and visit the friendly team at our kitchen showroom in beautiful Tonbridge, Kent so you can browse the range in person. When you choose to work with Kensington Scott, you can be sure our friendly and experienced team will work with you to guarantee a design solution that will be perfectly tailored to your kitchen space and provide the luxury and functionality required in a working kitchen. Our kitchens are certainly beautiful, but they’re not just for show - our range of kitchens are designed with everyday use in mind so that they are practical and functional in a personal way and tailored specifically to your needs. What makes Kensington Scott different? Beyond that fact that we design and install hand-crafted bespoke kitchens unrivalled in luxury, longevity and quality, we can also manage your project from start to finish. At Kensington Scott, we have close relationships with contractors, plumbers, electricians and more so that you don’t have to worry about managing what can sometimes be a time-consuming project with many different elements, because we’ll handle all of that for you. Our considerable experience with kitchen project management means that you can sit back, relax and look forward to your brand new, bespoke and hand-crafted kitchen without coming across any obstacles along the way. To find out more about our kitchens, please contact us today or feel free to drop by our kitchen showroom at any time. At Kensington Scott, we supply, design and fit a number of different Mereway kitchen styles so you can always be sure that something in our range will fit the feel of your home. Whether you’re looking for traditional British design or something a little more on the minimalist side, we can provide the perfect design solution and style for you. Kensington Scott supply and fit Mereway designer kitchens, which combine luxury, attention to detail, original design, solid craftmanship and all British made. These stunning bespoke kitchens have something to suit all tastes, from traditional country kitchen to contempory chic, mixing individuality and tradition to stunning effect. We've been working closely with Mereway for many years and consider their quality workmanship and designs to be unrivalled in the kitchen industry, that's why we only work with them. We supply high quality Bosch, Neff and Siemens appliances to complement your kitchen perfectly. Take a look at the full Mereway Kitchens portfolio and please feel free to pop along to our showroom in Tonbridge to see the quality and workmanship for yourself. Choosing a material for your kitchen worktops is an important step in the kitchen design process. In fact, it’s just as important as just about any other step, including flooring and cabinet styles. If you want a stress free, luxury kitchen then Kensington Scott is the kitchen firm for you. Lots of choice of units and appliances so you can get the exact look and functionality you want. The whole process from design to installation is seamless and compared to similar high end kitchens they are great value. We are thrilled with our new kitchen. Kensington Scott have turned our kitchen into an amazing place in which it is now a pleasure to prepare, cook and eat our food. They certainly ticked all the boxes and it is a pleasure to recommend their work. Mark and his team are so great to work with! They offer high quality British made bespoke kitchens, showcasing the best quality products. The creative team are very helpful and knowledgeable- we are always impressed with their attention to detail. We look forward to creating more exceptional homes together. We recently had our kitchen designed and fitted by Kensington Scott, the whole team are absolutely amazing! We had no clue about the sort of design we wanted our kitchen updated to and the designers had great ideas. Execution of the work was quick and the kitchen was fitted to perfection. The companies professionalism and business etiquette are outstanding. I highly recommend Kensington Scott to anyone planning a new kitchen or a make-over. I will definitely be using Kensington Scott again when I update any other rooms in my home. We can talk to you at our Tonbridge showroom at any time of the day - whether it's during office hours, or a private viewing any evening of the week, we will fit around your schedule. Book an appointment now and take your first step towards your dream kitchen.